Jacoba is a young opera singer from Toronto, Ontario who has been featured as a soloist with the Canadian Opera Company, Canadian Children’s Opera Company, Toronto Bach Consort, Opera McGill and has done vocal recordings for film soundtracks such as the Academy Award-winning Manchester by the Sea. She recently finished her Bachelor’s degree in Voice at McGill University and even more recently placed 3rd in the international Classical Singer competition held in Boston, Massachusetts. She’s excited to be a part of the world of Earth World! Andre Forget is a writer and critic. His work has appeared in The Walrus, The Literary Review of Canada, and Canadian Notes and Queries. He is managing editor at The Puritan, a Toronto-based literary magazine. 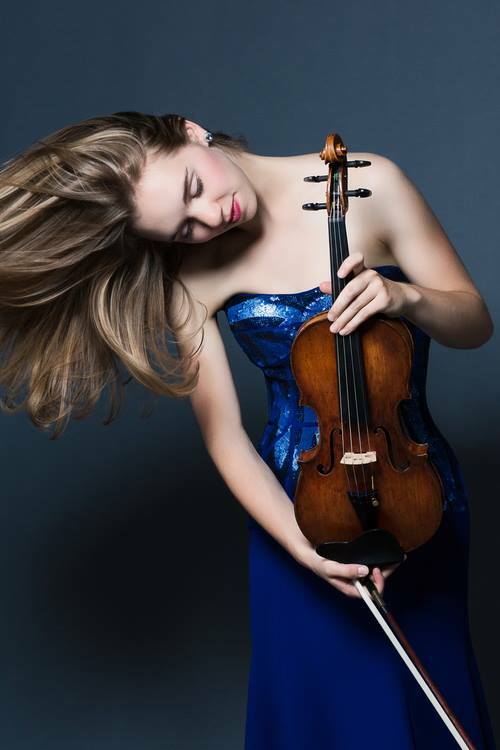 Originally from Saskatchewan, Canada, Amy Hillis is currently pursuing a Doctor of Music in Violin Performance at McGill University in Montréal with the esteemed violin professor, Axel Strauss. She is the winner of the 2017 McGill Concerto Competition and will perform as soloist with the McGill Symphony Orchestra during their 2017-2018 season. Her studies are funded by a Joseph-Armand Bombardier Canada Graduate Scholarships (CGS) Doctoral Scholarship from the Social Sciences and Humanities Research Council (SSHRC). Amy is also the recipient of a Professional Musician (Individual) grant from the Canada Council for the Arts as well as the prestigious Sylva Gelber Foundation Music Award which is given to Canadian musicians of outstanding ability and career potential. Amy performs on the 1820 Joannes Franciscus Pressenda, on loan from the Canada Council for the Arts Musical Instrument Bank. A recent graduate of the San Francisco Conservatory of Music, Amy completed her Master of Music in 2014 with renowned pedagogue and performer, Ian Swensen. She earned her Bachelor of Music degree in Violin Performance from McGill University under the tutelage of former concertmaster of the Orchestre Métropolitain, Denise Lupien. While growing up in Regina, Saskatchewan, Amy studied with the concertmaster of the Regina Symphony Orchestra, Eduard Minevich. A passionate orchestral musician, Amy is currently concertmaster of Montreal's Pronto Musica. Supported by the Canadian Aldeburgh Foundation, she has traveled to England on five different occasions to perform as part of the Britten-Pears Young Artist Programme as a principal violinist in the Britten-Pears Orchestra and with Aldeburgh Strings. In the summer of 2016, Amy soloed as concertmaster with the Britten-Pears Orchestra under the direction of Maestro Semyon Bychkov. Amy was also an associate member of Chicago's Civic Orchestra, concertmaster of the San Francisco Conservatory Orchestra and concertmaster of SFCM's New Music Ensemble. During her last two years of high school, she was first violinist in the Regina Symphony Orchestra. In addition, she was concertmaster of the National Youth Orchestra of Canada in 2008 under the direction of Sir Andrew Davis and Maestro Jacques Lacombe. Recognized for her leadership, Amy has won numerous orchestral awards including the prestigious Stephen Sitarski Leadership Award from the National Youth Orchestra of Canada. Amy maintains a busy schedule as a chamber musician. With funding and support from the Saskatchewan Arts Board, Amy is a dedicated member and manager of the Horizon String Quartet. During four different tours, the HSQ has performed over a hundred concerts for more than 30,000 young people in fifty different Canadian cities. Amy also performs regularly with Montreal's Collectif9 and toured with the nine-piece string ensemble as part of their 2015-2016 Volksmobiles Quebec tour. As winner of the Regina Musical Club Recital Competition, Amy performed with pianist, Meagan Milatz, during the RMC's 2014-2015 season. She has performed at distinguished chamber music festivals including the Montreal Chamber Music Festival, SoundSCAPE Italy, Regina Chamber Music Festival, Domaine Forget Chamber Music Academy, Moritzburg Academy Music Festival, and the Ritornello Music Festival. She has studied with renowned chamber musicians including Kim Kashkashian, Mark Sokol, Roger Chase and members of the Kronos Quartet, the New Orford String Quartet, the Miro String Quartet, and the Ying Quartet. Born in Quebec city, soprano Kimberley Lynch is now based in Montreal Quebec where she has recently completed her masters in opera and voice performance. After pursuing voice lessons in Calgary for many years where she grew up, she decided to return to the province of Quebec in order to pursue a bachelor of Voice performance at McGill University. After graduating with honours in 2014, she decided to continue her studies at McGill to obtain a Master’s in voice performance and opera under the guidance of professor Joanne Kolomyjec. Throughout the course of her university studies, she has appeared in numerous Opera Mcgill productions, the most recent one being the title role in Handel’s Rodelinda in March 2016. Other highlights include Amy March, in Little Women, by Mark Adamo, Barbarina in Mozart's Le nozze di Figaro, Cupid in Venus and Adonis by John Blow, and Peaseblossom from Benjamin Britten’s A Midsummer Night’s Dream. Throughout his career, Christopher Murtagh has been working in technology – from writing software, to architecting complex systems. For 6 years, he was the web system architect for McGill University’s Web Service Group where he co-developed the McGill Gateway — a custom-built database-driven web publishing system. He architected and oversaw development of the server system that runs the Gateway. Prior to joining McGill, he worked as a freelance IT consultant and after leaving McGill, returned to IT consulting. There he joined the team hired by Sony Entertainment to bring Linux to the PlayStation 3. Christopher became an active member of Montreal’s startup scene where he worked and consulted for several funded startups. He is currently serves as ombú’s CTO as well as the IT director of a medical imaging research company. Adrian Foster is an organist, composer, and teacher based in Montréal, Québec. Together with Joel Peters, he is co-founder and co-artistic director of Earth World Collaborative, where he continues his passion of pursuing radical and innovative artistic collaborations. Adrian is active as a performer, both as a soloists and collaborative organist, including frequent projects with soprano Kimberley Lynch. He is dedicated to promoting and performing new music and has premiered works by numerous composers, such as Michael Bonaventure, Jason Noble, and Noa Haran. As a composer, Adrian has worked on a wide range of projects spanning from liturgical (Electroacoustic Easter Vigil, Electroacoustic Vespers) to stage productions (wyïśya’s Inter-Being sculpture). His compositions frequently incorporate electronics and are heavily influenced by minimalist and ambient styles. Originally from Saskatchewan, Amy Hillis is quickly establishing herself as one of Canada's most versatile and vibrant violinists. As part of her busy solo, chamber music and orchestral performance schedule, Amy performs on the 1820 Joannes Franciscus Pressenda, on loan from the Canada Council for the Arts Musical Instrument Bank. She is the winner of the 2017 McGill Concerto Competition and will perform as soloist with the McGill Symphony Orchestra during their 2017-2018 season. With funding and support from the Saskatchewan Arts Board, Amy has performed for more than 40,000 young people in fifty different Canadian communities during five tours as member of the Horizon String Quartet. Amy is also the recipient of the prestigious Sylva Gelber Foundation Music Award which is given to Canadian musicians of outstanding ability and career potential. Amy is currently pursuing a Doctor of Music in Violin Performance at McGill University in Montréal with the esteemed violin professor, Axel Strauss. Her studies are funded by a Joseph-Armand Bombardier Canada Graduate Scholarships (CGS) Doctoral Scholarship from the Social Sciences and Humanities Research Council (SSHRC). In addition to concertizing, teaching, conducting, and composing, Joel Peters is co-artistic director and founder of Earth World, a creative force which generates new music, art, and literature through collaboration. Peters began piano lessons at the age of 15 with Audrey Falk-Janzen in Waldheim, Saskatchewan. Eight years later he earned a Bachelor’s of Music from Canadian Mennonite University, studying piano with Cheryl Pauls and organ with Dietrich Bartel. In 2014, he obtained a Master’s from McGill University, studying repertoire with Hans-Ola Ericsson and improvisation with Dr. William Porter. In May, he graduated from the same university with an Artist Diploma. Among the numerous awards Peters has received are those recently won in 2016 at le Concours OSM Manuvie: third prize in the organ category; prize for the best performance of the imposed Canadian work; Stingray Rising Stars Award (Publics Choice); and the Orford Music Prize. And of personal highlight, Peters received perfect scores from the jury members for his final Artist Diploma recital entitled, “Organ Ocean Waves of Sound.” This project also inspired the short story “The Lower Registers” by Toronto-based writer André Forget (core member of Earth World). Joel Peters is currently Music Director at St. John’s Lutheran in Montreal.